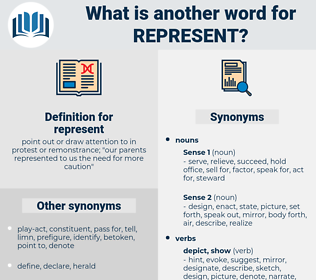 What is another word for represent? point out or draw attention to in protest or remonstrance; " our parents represented to us the need for more caution"
REPS, stands, representations, representation, Faces, representative, representatives, reflect. Originated, Constituting, constitute, comprise, present, depict, embody, illustrate, correspond, form, provide, account, representative, symbolize, mean, defend, offer, involve, indicate, 're, stand, demonstrate, create, appear, serve, imply, express, mark, contribute, consist, generate, bring, cover, submit, describe, exemplify, include, testify, contain, characterise, show, entail, reflect, have. 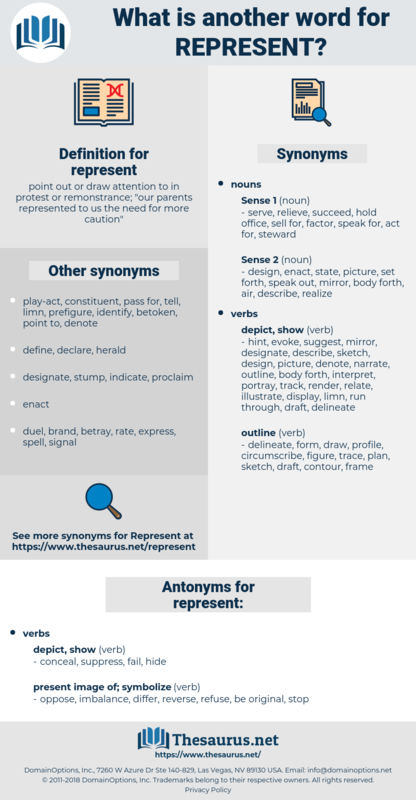 constitute, constitutes, expenses, comprise, present, depict, portray, representation, signify, embody, illustrate, correspond, form, provide, account, is, representative, symbolize, amount, mean, defend, offer, involve, indicate, encompass, stand, demonstrate, create, appear, equate, serve, imply, express, mark, contribute, consist, translate, generate, bring, capture, cover, simulate, submit, pursue, appoint, impose, convey, describe, exemplify, include, testify, contain, resubmit, participate, spell, Establishing, show, entail, reflect, have, incorporate. oppose, imbalance, differ, reverse, refuse, be original, stop. No sensible man ought to care a snap of his finger either for them or for what they represent. The only thing that disappointed me was, that there was no one there to represent Oldcastle Hall. rapprochement, rubber cement, refreshment, represented. portray, actualize, symbolize, misrepresent, dramatize, embody, dramatise, actualise, symbolise, belie. utter, describe, verbalize, remonstrate, give tongue to, point out, express, depict, verbalise, draw.